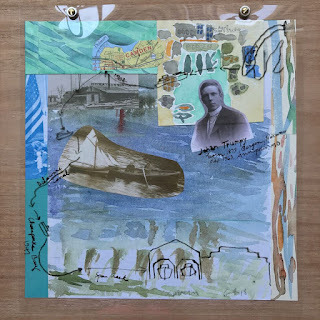 My panel for One House about my grandfather Johan Trumpy, who came to the US in 1902 from Norway. ArtWatch collective’s One House Project exhibit brings together participants, both artists and community members, who have been given a simple wood panel measuring 12-inches square on which to tell the story of one of their ancestors who came to this country from elsewhere, whether voluntarily or involuntarily. Participants who are themselves immigrants were encouraged to use the panel to tell their own story. Native Americans, who were the first inhabitants of this land, may honor any ancestor whose life story is important to them. ArtWatch Collective will construct an underlying structure — a house — and attach the completed panels to the outside, covering it completely. The One House Project exhibit will also incorporate audio and video recordings of contributing participants.